The following table shows the rates for Pasadena ARM loans which reset after the tenth year. If no results are shown or you would like to compare the rates against other introductory periods you can use the products menu to select rates on loans that reset after 1, 3, 5 or 7 years. By default purchase loans are displayed. Clicking on the refinance button displays current refi rates. A ten year adjustable rate mortgage, sometimes called a 10/1 ARM, is designed to give you the stability of fixed payments during the first 10 years of the loan, but also allows you to qualify at and pay at a lower rate of interest for the first ten years. There are also 10-year balloon mortgages, which require a full principle payment at the end of 10-years, but generally are not offered by commercial lenders in the current residential housing market. It is common for balloon loans to be rolled over when the term expires through lender refinancing. How do 10 Year Rates Compare? Teaser rates on a 10-year mortgage are higher than rates on other ARMs & they do not offer much of a yield benefit over fixed rate mortgage either. A 10-year could be a good choice for those looking to spend the minimum possible buying their home in the short term while they achieve greater returns elsewhere. When Are Rates The Best? 10-year ARMs, like 1, 3 & 5-year ARMs, are based on various indices, so when the general trend is for upward rates, the teaser rates on adjustable rate mortgages will also rise. Currently rates are low, in-part because the economy has grown sluggishly after the recession, and because the Federal Reserve has bought a lot of treasuries & mortgage backed securities in order to take bad assets off bank balance sheets & drive down yields. The FHFA also publishes a Monthly Interest Rate Survey (MIRS) which is used as an index by many lenders to reset interest rates. The initial rate, called the initial indexed rate, is a fixed percentage amount above the index the loan is based upon at time of origination. This amount added to the index is called the margin. Subsequent payments at time of adjustment will be based on the indexed rate at time of adjustment plus the fixed percentage amount, same as it was calculated for the initial indexed rate, but within whatever payment rate caps are specified by the loan terms. Though you pay that initial indexed rate for the first five years of the life of the loan, the actual indexed rate of the loan can vary. It's important to know how the loan is structured, and how it's amortized during the initial 10-year period & beyond. Payment rate caps on 10/1 ARM mortgages are usually to a maximum of a 2% interest rate increase at time of adjustment, and to a maximum of 5% interest rate increase over the initial indexed rate over the life of the loan, though there are some 10-year mortgages which vary from this standard. Some ten year loans have a higher initial adjustment cap, allowing the lender to raise the rate more for the first adjustment than at subsequent adjustments. It's important to know whether the loans you are considering have a higher initial adjustment cap. In analyzing different 10-year mortgages, you might wonder which index is better. In truth, there are no good or bad indexes, and when compared at macro levels, there aren't huge differences. Each has advantages and disadvantages. One of the things to assess when looking at adjustable rate mortgages is whether we're likely to be in a rising rate market or a declining rate market. A loan tied to a lagging index, such as COFI, is more desirable when rates are rising, since the index rate will lag behind other indicators. During periods of declining rates you're better off with a mortgage tied to a leading index. But due to the long initial period of a 10/1 ARM, this is less important than it would be with a 1 year ARM, since no one can accurately predict where interest rates will be ten years from now. With a 10/1 loan, though the index used should be factored in, other factors should hold more weight in the decision of which product to choose. The index does affect the teaser rate offered. What Are The Benefits of a 10 Year Mortgage? Knowing what type of mortgage you're getting can be a challenge, since so many things that sound like a good idea are often the things that can cost you the most money. Though 10-year adjustable loans are all lumped together under the term "ten year loan" or "10/1 ARM" there are, in truth, more than one type of loan under this heading. Understanding which of these types are available could save your wallet some grief in the future. Some types of 10-year mortgages have the potential for negative amortization. Negative amortization, to put it simply, is when you end up owing more money than you initially borrowed, because your payments haven't been paying off any principle. Negative amortization can be especially devastating in times of dropping real estate values, since the total amount you owe on the mortgage is increasing while the value of the property is dropping, decreasing your equity stake. When the value of the property falls below the amount owed, this is called being "under water." Some ARM contracts which allow for negative amortization have a cap of 110% to 125% of the initial loan amount. When the loan reaches this level the mortgage automatically converts into a fully amortizing mortgage which requires principal repayment. The following table lists historical mortgage rates for 30-year mortgages, 15-year mortgages, and 5/1 ARM loans. 10-year ARMs charge a rate which is significantly higher than 5/1 ARMs and quite close to what a 15-year fixed rate mortgage trades at. There are three types of 10-year mortgages: Hybrid ARM, Interest-only ARM and Payment-option ARM. Hybrid ARM: With this type of mortgage, the actual indexed rate is fixed for the first five years of the loan, and then adjusts every year thereafter, a sort of hybrid between a fixed rate and an adjustable rate. With a hybrid loan the principle is being amortized over the entire life of the loan, including the initial ten year period. This is generally the safer type of 10-year ARM for most people, since there is no potential for negative amortization. Generally the rates on these loans are slightly higher than other 10-year loans, since there is less potential profit to the lender. FHA ARMs are hybrid mortgages. Interest-only (I-O) ARM: With an interest-only loan you are paying only the interest for the initial 10 year period. Your payment is smaller for the initial period, but you aren't paying back any principle. With some I-O mortgages the interest rate is adjusting during the initial I-O period, which gives a potential for negative amortization. Generally, the longer the I-O period, the higher the monthly payments will be after the I-O period ends. These loans are generally priced more attractively initially, because there is more potential profit for the lender. The longer the initial duration of interest-only payments the higher the subsequent monthly payments will be, as the loan converts into a 30-year amortizing loan, which means the full principal will need to be repaid in the final 20 years of the loan. Payment-option ARM: This type of mortgage is also called a pick a payment mortgage. It allows you to choose among four types of payment types in any given month. You can choose a traditional payment which covers principal and interest to repay the loan in 30 years, a higher payment that repays the loan in 15 years, an interest-only payment which will cover only the interest and no principle, or you can choose a minimum payment that may be less than the amount of interest due that month. Generally these types of loans, while offering some flexibility to those with uneven incomes, have the greatest potential downside, since the potential for negative amortization is great. In addition to regular rate resets, these loans typical get recast every 5 years or whenever a maximum negative amortization limit of 110% to 125% of the initial loan amount is reached. Calculate 10/1 ARMs or compare fixed, adjustable & interest-only loans side by side. In general, each type of loan has a different repayment and risk profile. The following graph is for a 5/1 ARM, but it does a good job of showing how payments can change over time. 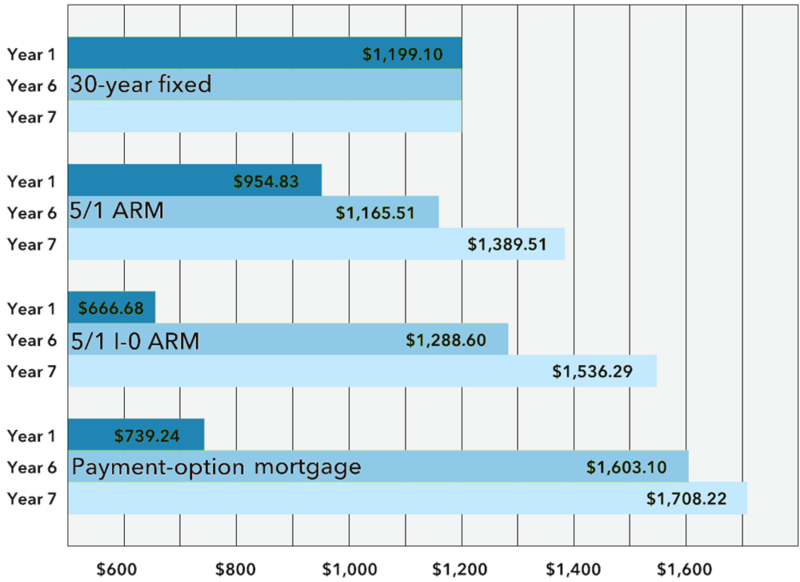 Here's a comparison of ARM loan payments against the two most popular types of fixed-rate mortgages, with all other things being equal, assuming an adjustment to the maximum payment cap. 20% down on a $250,000 home. 2/2/5 rate cap used on ARM loans. Listed APRs accurate as of November 2, 2017. 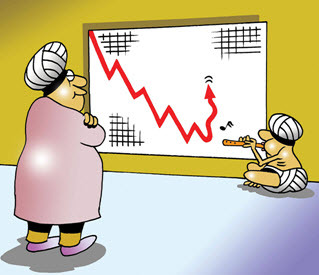 Market conditions regularly change. Monthly payments cover principal & interest, but do not include other costs of ownership like closing costs, homeowner's insurance, PMI, HOA fees and property taxes. For the sake of calculation simplicity, negative amortization is presumed not to happen on ARM loans. If it did happen, the calculations would get much more complex. When shopping for a 10-year mortgage rate, if you intend to live in the house for the duration of the loan the initial rate should be of less concern than other factors. The margin amount, the caps, the maximum lender fees and the potential for negative amortization and payment shock should all weigh more in your decision than the initial rate. Only when you've determined you can live with all these factors should you be comparing initial rates. You can also download an ARM loan worksheet & bring it to your financial institution. We offer versions in the following formats: PDF, Word & Excel.